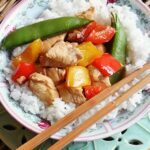 If you love stir fry like I do, then a recipe for Kung Pao Chicken is most likely at the top of your to-make list. 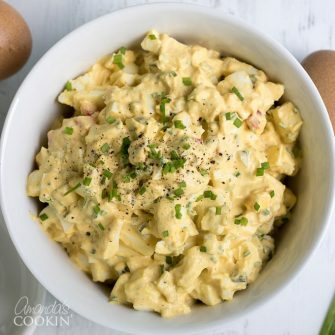 This recipe does not disappoint and uses only fresh ingredients, making it not only delicious but better for you than using premade bottled sauces. Using low-sodium soy sauce and fat free broth makes it even better for you! 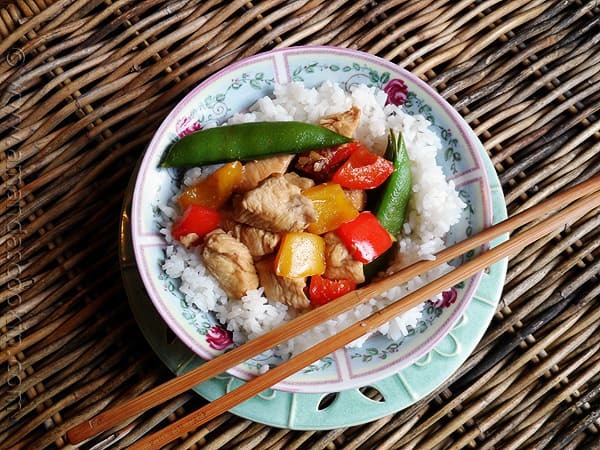 This recipe was slightly adapted from Jaden Hair’s new book Steamy Kitchen’s Healthy Asian Favorites: 100 Recipes That Are Fast, Fresh, and Simple Enough for Tonight’s Supper . You may recall that I recently posted another recipe from this book – the Chinese Style Parchment Fish which was positively delicious! I’m really looking forward to trying several more recipes from the pages of this book and recommend you trying it out yourself. This is actually Jaden’s second book, her first was Steamy Kitchen Cookbook: 101 Asian Recipes Simple Enough for Tonight’s Dinner , which I will be acquiring soon! We are big stir fry fans. 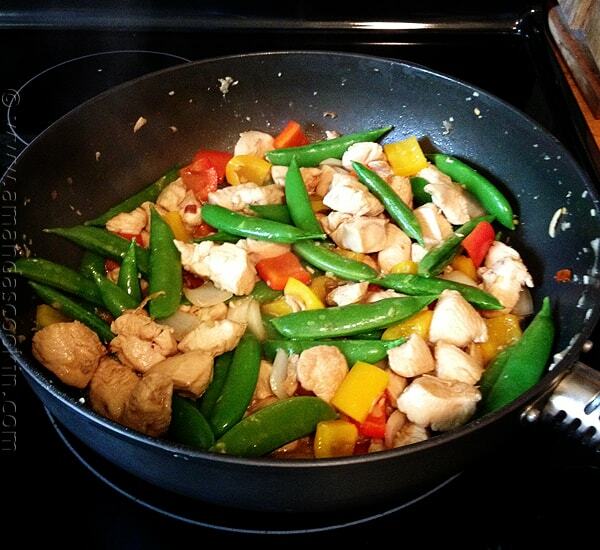 You can see that from all the stir fry recipes I have posted on this blog. 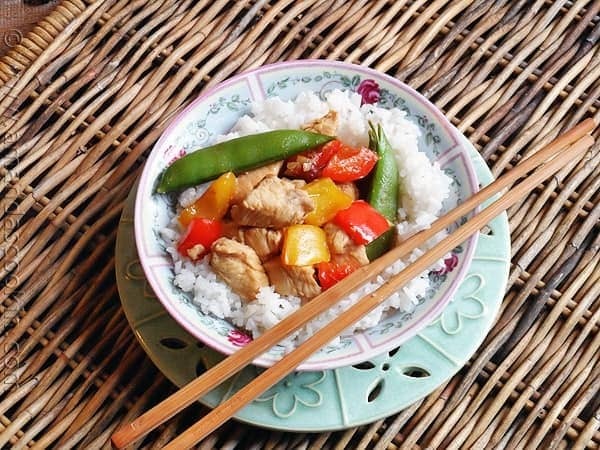 I’m happy to add this Kung Pao Chicken to the mix! If you have the book, turn to page 146. If you don’t have it, and you love Chinese food, you’ll seriously want to consider getting your own copy. 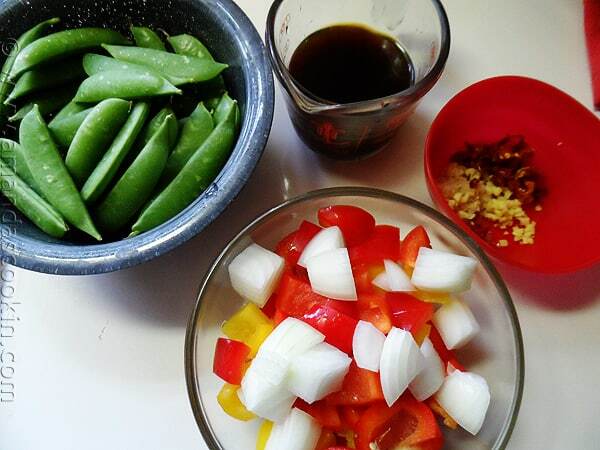 The book only mentions bell pepper in the ingredients, but the photo in the book shows snap peas, so I added some to mine along with some onion. The heat from this dish comes from the red chiles. You can control how much heat yours has by keeping all the chile seeds for the spiciest possible version, or removing them altogether for a milder recipe. You can certainly regulate the temperature of this dish by keeping some of the seeds, it’s totally dependent on your tastes! I use a ManPans wok, which means I don’t turn my up to high like it states in the instructions. For any other wok you do. ManPans retain heat really well and putting it on high would be overkill. 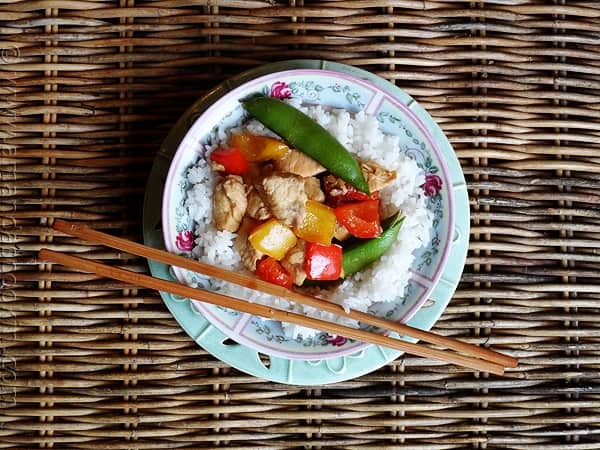 Made with fresh ingredients and low-sodium and fat-free ingredients, this Kung Pao Chicken is delicious and good for you! In a bowl, combine the cornstarch with 1 teaspoon of the soy sauce. Pour over chicken and toss to combine. Set aside to marinate for ten minutes. Soak dried chiles in hot water for several minutes. Remove from water and chop. 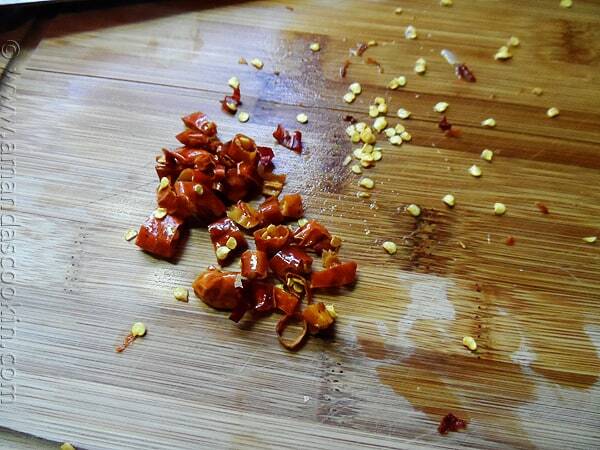 For a less spicy dish, discard some or all of the seeds. Heat wok over high heat. Ad canola oil and swirl to coat. Add the chicken, spread it out across the surface of the pan. Sear on both sides until lightly browned, but not cooked all the way through, about 4 minutes. Add the chiles, garlic, bell pepper, onion and snap peas. Stir fry several minutes, until fragrant. Add remaining one teaspoon of soy sauce, the broth and vinegar. Bring to a simmer and turn heat down to medium low. Cook for 2-3 minutes, until chicken is cooked through. Kung Pao is one of my favorites too. It looks delicious. Looks delicious!!! All the colors of those veggies just look so bright in healthy in the home cooked version!!! Yum. We love stir fry too and I have to get my hands on that new book!! Beautiful colors. You will love the book Cathy!